Angularjs routeParams is a service that allows you to retrieve the current set of route parameters(URL Parameters). In previous tutorial, we had the basic structure so that our application can handle routing but we were only using a single partial. All it does is show a list of guitars. 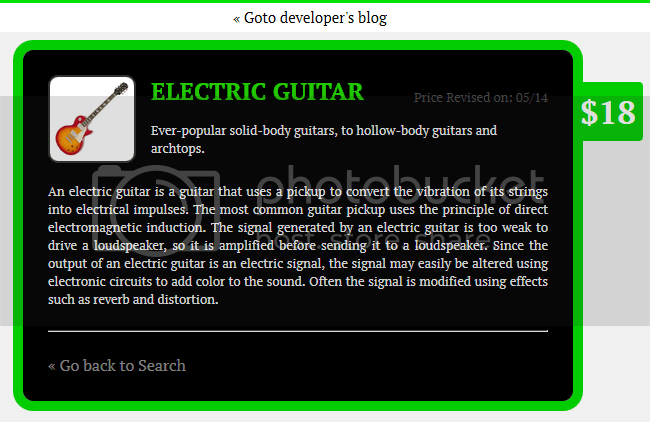 It would be great to make list elements click through more detailed view of the guitar information i.e jump to another page that holds detail of clicked guitar. We can do this by wiring up a second partial using $routeParams service. Its the same code we added in previous tutorial which tells that when somebody goes to /details and asks for a :guitarID (will get to it later) then goto template URL partials/details.html in project folder and get details.html file(get to it later). Finally, DetailsController is controller handling details.html file. Easy enough. What we are going to pass here? I mean in the link? answer is simple, we are going to details.html page with item id on which we clicked. #/details tells that you need to JUMP to details section which is handled by angular in app.js file. Next guitarVariable is the variable you will find in controllers.js file which holds the data from data.json file. Next indexOf will get the position of guitar coming from data.json file and tells that for example violin is at fourth place in data.json file so it will return 3 because its an array, it starts from zero, remember that? I am sure you do. item is an item in guitarVariable. Okay and then after guitar details we closed the anchor tag. You may be wondering how it gonna show us different id for different guitar? this is because above anchor tag we are using ng-repeat that iterates through data.json file. We know that guitarVariable is the variable in controllers.js file holding data coming from data.json file. So we created a model named as guitarVariable. Then we used guitarVariable and asked for whichGuitar, whichGuitar is the itemID or guitarID coming from list.html file along with details.html file like this sitename.com/index.html#/details/2 so we in other words we are specifiing the details of that guitar whose id is coming in whichGuitar. Remember that whichGuitar is already defined in controllers.js file. Rest of the code is just about placing guitar detail(name, dateAdded, price, longDescription etc) in some good way. Finally we need to add some styling in style.css, add some data in data.json file and an image. You can download these three files from here Download (it has 3 files. Problem: Hmmm… IE8 doesn’t seem to want to click through to the Details. I’ve confirmed I’m in “Browser Mode: IE8”, “Document Mode: IE8 Standards”. (If I switch to “Quirks Mode”, then everything other than the “Developer’s Blog” banner vanishes.) I’ll keep playing with it. Solution: Figured it out. IE 8 and lower do not know what .indexOf is. I found the fix here: http://stackoverflow.com/questions/3629183/why-doesnt-indexof-work-on-an-array-ie8 Applied it to your demo and now it’s pulling in the guitarID’s just fine. Thanks for help David Raasch.